RED MILLS Day was red hot in every way on Saturday in Gowran Park. The crowds turned out in their thousands for what has become a “must do” day in the Irish racing calendar. The racing was red hot with Rachael Blackmore and Joseph O’Brien both recording trebles. In the “Style Stakes” the RED MILLS Marquee was the real winner where Yvonne Connolly and Marietta Doran hosted a great style event. 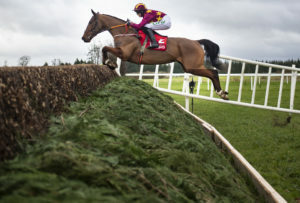 On the track, there was huge interest in the RED MILLS Chase where Monalee from the Henry de Bromhead stable was the big fancy in a very select four runner field. Stern opposition was expected to come mainly from Willie Mullins trained Killutagh Vic, however the JP McManus owned duo, Edwulf trained by Joseph O’Brien and Anibale Fly trained by Tony Martin were given every chance. Rachael Blackmore aboard Monalee took up the running from the start and turning for home her three rivals were ready to pounce. However, Monalee was never headed and was chased home by Barry Geraghty on Anibale Fly. The big question now for connections of Monalee is which race to go for in Cheltenham the Ryanair Chase or Magners Gold Cup with the trainer saying “it’s 50 : 50”. 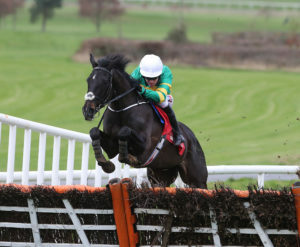 There was better luck for Barry Geraghty in the RED MILLS Hurdle where he guided the Joseph O’Brien trained Darasso to a comfortable victory ahead of last years winner Forge Meadow. The other two winners for Rachael Blackmore on the day were Star Max in the first and Smoking Gun in the fourth both for Joseph O’Brien. Local trainer Willie Mullins was not to be outdone one the day when the very fancied Duc Des Genievres with Paul Townend on board claimed the Bet Victor Beginners Chase. Reflecting on a great day, Gowran Park Manager Eddie Scally said; “This was one of our biggest RED MILLS Days ever with an attendance of over 7,000 people. Following on from the success of last month Goffs Thyestes Day we are thrilled with the support we have received from the public thus far in 2019. All roads now lead to Saturday March 9th Holden Plant Rentals Day which is our last jumps meeting of the 2019 season”. 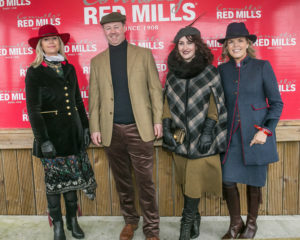 The fashionistas turned up in their droves for the RED MILLS Store Winter Racing Style Event, which was hosted this year by stylist and local woman Marietta Doran, who assisted guest judge Yvonne Connolly in making the tough decision of choosing the best dressed lady & gent. Best dressed lady was Rebecca Foley from Graiguenamanagh whose stunning outfit was topped off with a game feather which her dad had added to her headpiece the morning of the race day. Declan Reardon, best dressed gent, wore a tweed jacket which his picked up at Cheltenham, and a tweed cap from Newmarket – very in keeping with the winter racing theme. Runners up were: Michelle Treacy, Anne Leneghan, Gerard Breen, and Andy Kennedy. Both Rebecca and Declan each won a €500 voucher for the RED MILLS Store.